As the school year winds down, it's time to start thinking about summer reading. We at Pine Glen are very excited that Amanda Hogue-Lavallee, youth librarian at the Burlington Public Library, will be joining us in classes this Friday to talk about the great summer programming the BPL has to offer! These visits always get students excited about summer reading, and we're very happy Ms. Lavallee is taking time to visit! Our Spring Enrichment Program: Keith Michael Johnson: "Bubbleology"
We are very excited to welcome Keith Michael Johnson to Pine Glen on Tuesday, June 16th. 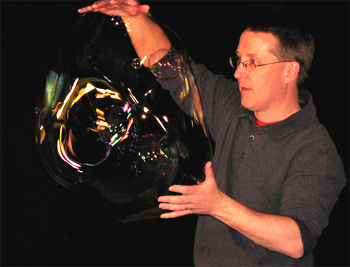 He will perform his show Bubbleology for K, 1, and 2 at 8:45am and then for grades 3, 4, and 5 at 9:45am. For more information about the show and Keith, check out his website! We know the students will enjoy this fun, educational program. On Sunday, May 31, 2015, the Burlington Education Foundation (BEF) is holding their 11th Annual “Exercise for Education” 5K Road Race and ½ Mile Family Fun Run at Burlington High School . Check-in for the event begins at 8:00am with the Family Fun Run beginning at 9:00am, followed by the start of the 5k which begins promptly at 9:30am. Please visit BEF's website for more information on the activities as well as online registration. All pre-registered participants are guaranteed a free t-shirt. NEW This Year - Chip Timing! - with instant results. Run, Walk, Volunteer or join us as a spectator! Don’t miss out on this great community event or the chance to win a Grand Prize Raffle!! BEF's Mission is to channel donations from businesses and individuals to provide Burlington educators with an additional source of funding for creative and innovative curriculum enrichment programs. Help us make a difference in the Burlington Public Schools! Thanks to everyone who joined us at the Book Fair last night! It was a very successful Arts and Technology night! Don't forget...the Book Fair continues until tomorrow, Thursday, 5/13 at 2:30pm, so there's still time for students to browse and purchase. Thank you again for your support of Arts and Technology night and the Book Fair. If you have any questions about the book fair, please feel free to give Miss Carney a call at (781) 221-7798.